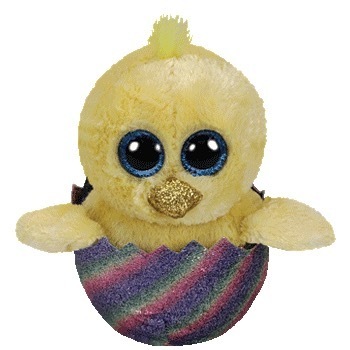 Megg is a yellow chick with large, glittery blue button eyes and a sparkly gold beak. She sits inside a sparkly rainbow coloured shell and has a tuft of yellow fur on top of her head. Megg was released in January 2019. Her Birthday is on 15th March. It appears that Megg is exclusive to Walgreens, although that hasn’t been confirmed yet. Megg is available as this small 6″ Beanie Boo and a medium 9″ Beanie Boo Buddy.